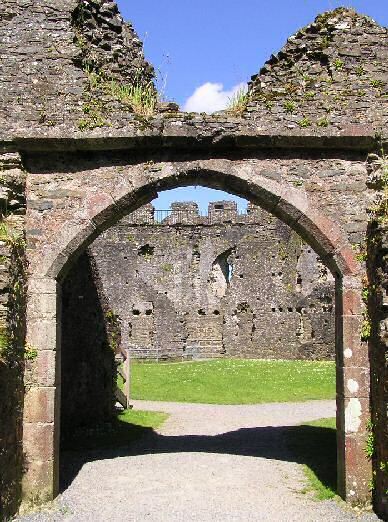 The inner arch leads from the gatehouse into the courtyard. It is made of high quality carved Pentewan stone and contrasts strongly with the local shillet stone used to make the remainder of the castle. It is obvious from the ragged edges to other doors and windows, that other fine stone has been robbed from the castle over the years. Pentewan lies on the south coast of Cornwall on Mevagissey Bay, to the south of St Austell. The quarry there is long disused. The stone, noted for its extreme hardness, was mined there since medieval times and has been used throughout Cornwall and the U. K., including many manor houses and Holy Trinity Church in St. Austell town. It is an elvan stone similar to granite but of much finer grain and can be carved freely into intricate shapes. It would have been quarried and brought to Restormel, a distance of some 10 miles.